As I've said here, there were tons of things I did while on vacation. I went to our house's developer for documents and payments, met with the travel agent several times for our visa application, packed our belongings just in case we push through with our plan to give up our rented house and move to our new house, and visited friends and families. 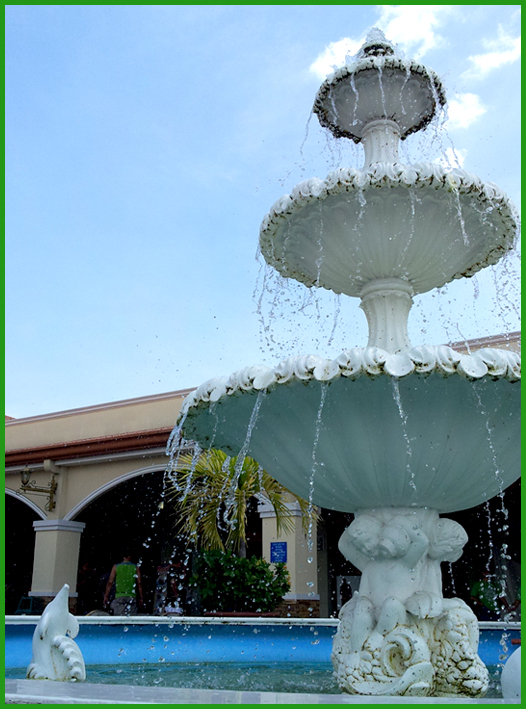 A few days after our arrival, we went to my mother in Bataan. 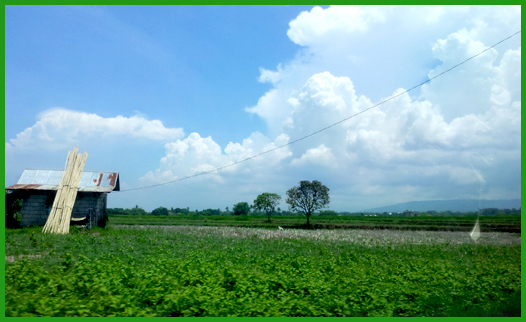 My kids were very happy because they got to enjoy again the beauty of nature, Philippine countryside version. Fruit bearing trees, vegetables grown by their grandma, chickens being chased by dogs, bamboo bed under a tree, blue sky and the thickest formation of clouds above. Except for the scourging rays of the sun, the day was perfect and the kids were excited and happy all throughout the day. Fred and I were born and raised in the city and we didn't go to the provinces of our parents often. So whenever Gabby and Sunday squeal at the sight of soil, grab their shovels and start digging, we understand. I only got to play with soil when I was nine years old or younger, when the vast vacant lot near our house in Makati was not paved yet and sold to the government for development. That was where we went to in the afternoons, chased dragonflies, picked flowers and climbed aratiles trees. Those were my fave childhood moments. I remember how afraid I was to cross the bridge made of a thin plank of wood just to reach that vacant lot. One wrong step and I'll be in the shallow river below, hurt by the big rocks and cheeks flushing red at the sight of my playmates looking down or laughing hard at me. I don't remember if I fell down, I just know I had some scratches from climbing trees and stumbling on stones while chasing those dragonflies. On the way home, we stopped by Mega Station in Pampanga for a quick halo-halo session. Dropping by there is becoming a habit whenever we go to Bataan. We never miss Chowking's Halo-Halo. Maybe next time, we'll try the famous halo-halo of the nearby Razon's. 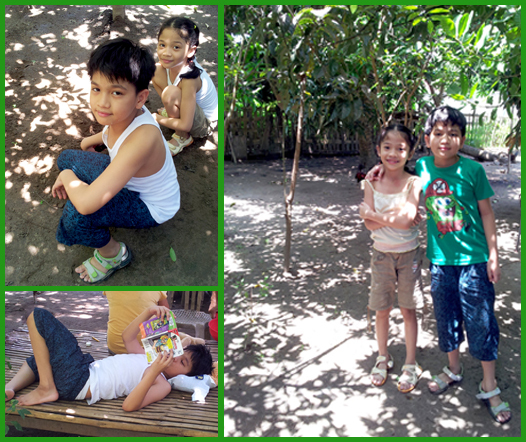 The kids had fun on that short trip to Bataan. Maybe next time when Fred is with us on our next vacation, we'll spend more time in the countryside. And next time, I'll teach them to catch dragonflies. Hi ate Beth. Thanks for visiting. Me too I haven't been doing my rounds. I'm glad you're back. And hopfefully, you'll get your family visa soon. 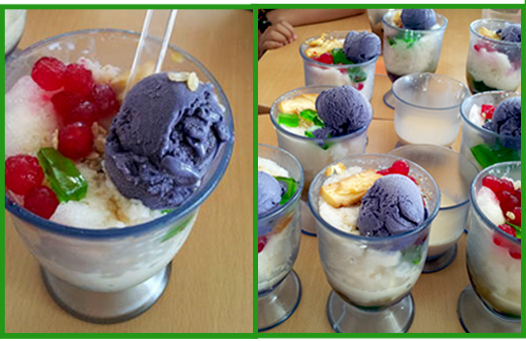 I so miss Halo-Halo. ang jinet dito sa UAE grabe! Hi there again Beth! Glad to know that you were able to visit your Mom in Bataan. Saan kayo sa Bataan? I love the province! It's like my second home since my sister lives in Balanga. Gabby and Sunday surely had fun exploring their granny's countryside home. I'm amazed sa bilis nilang lumaki! Both good looking just like their parents eh! Btw, we've tried Razon's halo-halo there in Mega Station. I feel it's not worth the price. Chowking pa rin ako. hehe.. Thanks so much for dropping by, Ate Beng even though you know that I seldom post hehehe. :) My sincere thanks. Take care! Wow, those halo2x look yummy!. Lalo ko tuloy na miss ang Pinas. I's nice to visit our loved ones every once in awhile...where we grew up. How, i wished i can visit my parents often. Kids a few decades ago are more blessed to be able to play under the sun and get dirty all over. It is a nice move to bring your kids to the province so they too could enjoy urban life though brief and be able to get to know their roots. Yes, that's true. That's why whenever we have budget, we always go to the province. They like looking at farm animals, picking veggies and digging! Thanks for taking time to read my posts. l appreciate comments, if any. I would love to return the favor whenever possible. Have a nice day! Whenever I chat with my friend based in Abu Dhabi, I always ask her what she will cook for an upcoming occasion, and she would promptly send snapshots of dishes I only dream of cooking. And when I posted the photo of my husband and me on my Facebook account, with a short "A trip to Almarai Dairy Farm" caption, she, later on, commented that she and her partner like Almarai products especially the yogurt and fresh milk. That's when I realized that although we're miles apart, my friend and I still have something in common: we enjoy the same brand of milk and juice drinks. It's the start of Gabby and Sunday's vacation! And I'm back to the things that I always take for granted: reading and blogging. I've always looked forward to posting here but life has been a whirlwind for the past months. Gabby graduated from primary school and will be in high school this June. Yes, you read it right. I now have a high school kid. How time flies! I got so sick after that and was rushed to the ER and was given antibacterial medicines intravenously. But now, I'm back and raring to blog again. Before I post another event or place, let me just finish Sunday's field trip. Before their visit to Prince Salman Science Oasis, the kids went to Star City in Exit 9 first. We've been passing by this amusement park for the longest time and I am really curious as to what is inside it. Of course, I know there are rides. But what kind of rides? Are abayas taken off or women ride wearing it? These were the questions I had before entering the park.